Just before Christmas I attended a talk by Ingrid Pollard at Tate Britain as part of their Conversation Pieces series. It got me thing about my previous post talking about landscapes as contested places and I thought it would be interesting to touch upon the visual relationship between rural England, notions of Englishness and ethnicity. 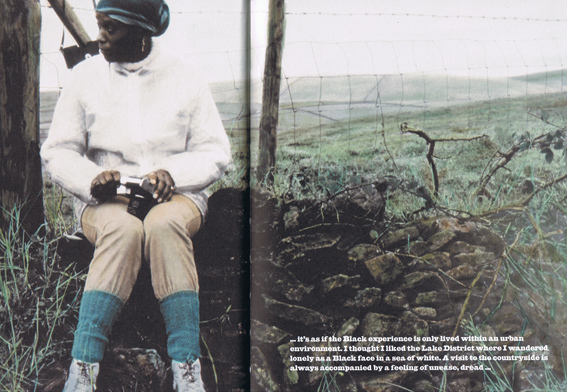 Pollard first came to public attention in 1987 with Pastoral Interlude, a series of photographs about Black people’s experience of the English countryside, particularly the Lake District. Steeped in the heritage of Wordsworth and the Romantic poets, her photographs explore the beauty of the English landscape and coastline, alongside the memories hidden within England’s history and its relationship to Africa and the Caribbean. Her interest in the layers of history is echoed in her use of 19th century photographic techniques. Twenty years after her Pastoral Interlude work was made, I wonder whether Pollard would still find the English countryside as insular and racist as she did then? Another photographer, whose work has challenged our stereotypes and conventional readings of English rural landscapes would be John Kippin. Kippin’s work pays allegiance to the conventions and traditions of pictorial landscape whilst foregrounding issues within contemporary culture and politics. 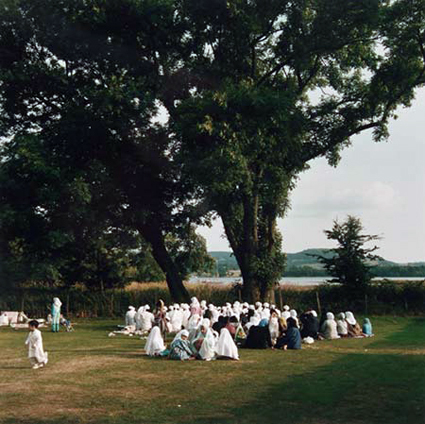 Note particularly his photograph ‘Prayer Meeting, Windemere’ taken from a body of work called Nostalgia for the Future. This projection of a dominant culture in the countryside can be seen when we look at the preponderance of white, middle-class, middle-aged members of the National Trust (see this article in The Independent). 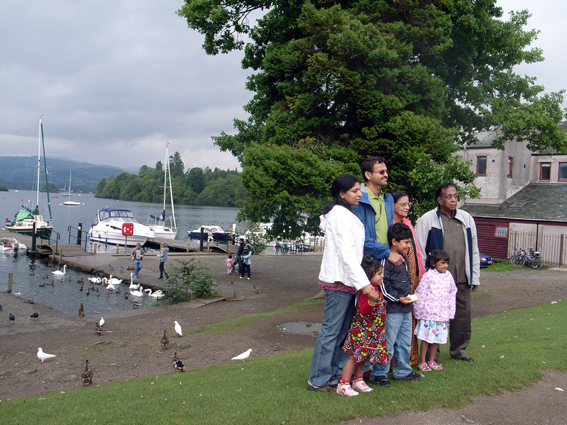 It was also recently highlighted in a study by the Commission for Racial Equality (2004), which showed that although ethnic minorities make up 8% of the UK population they represented just 1% of visitors to the countryside. 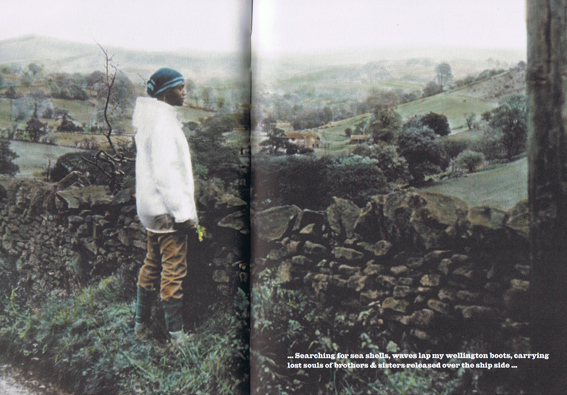 The then chairman of the Commission, Trevor Phillips, suggested that a form of “passive apartheid” existed in the British countryside. His comments certainly sparked quite a debate. However, it was interesting to see how many ethnic minorities disagreed with his analysis (see replies posted on the BBC News Online here) and actually felt quite at home in the countryside. This summer there was an article in The Guardian where four journalists described their memories of holidays in the UK. 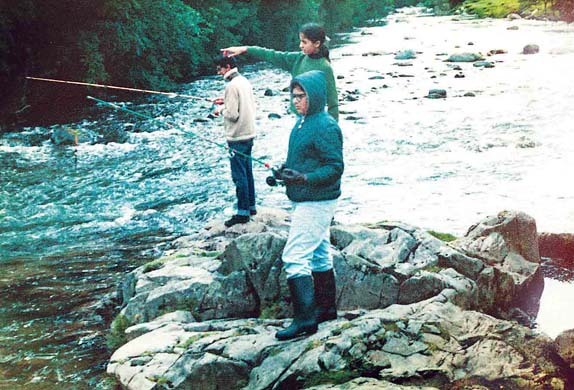 British born writer Maya Jaggi described her experiences of childhood holidays in the Lake District in the 1970s. In relation to my own journey around England for this project, while I found that much of rural areas in the West Country and Northumbria to be very white, in the Peak District, Yorkshire Dales, North Yorkshire Moors and Lake District I was surprised to witness relatively large numbers of ethnic minorities engaging with the countryside (as Wombell alluded to, this would make sense given the proximity of these rural retreats to large towns and cities with substantial ethnic minority populations, like Burnley, Bradford, Leeds and Blackburn), and seemingly not alienated by the environment. 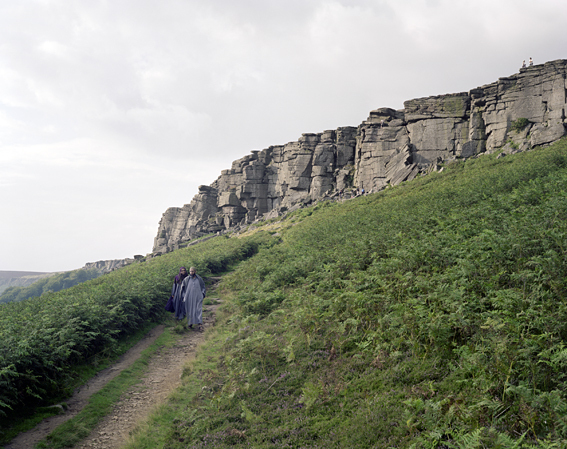 Take for example my photograph below of rock climbers on Stanage Edge in the Peak District. 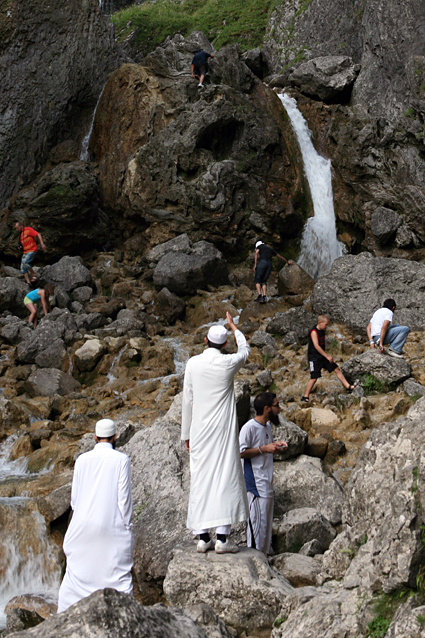 In the foreground a Muslim couple wearing distinct grey robes walk on a footpath through the landscape. Our tendency to ‘read’ this view in terms of traditional English activities is hard to resist and the couple therefore seem to be ‘out of place’. On speaking to them I learned that they were from Leicester on a weeks walking holiday, staying at a B&B in the nearby village of Hathersage. They spoke of feeling completely at ease in the area and described how they often spent their holidays exploring the English countryside. One organization that is trying to engage more ethnic minority groups with rural England is the Mosaic Partnership. Mosaic is an organization forging links between black and minority ethnic community groups across England and Wales with four National Park Authorities (the Peak District, Yorkshire Dales, Brecon Beacons & North York Moors), the Youth Hostels Association (YHA), and the Campaign for National Parks (CNP; formerly the Council for National Parks). They are attempting to promote National Parks as part of our shared cultural heritage, as well as places offering opportunities for physical recreation and spiritual renewal. You can read accounts written by several ethnic groups who have taken tours in National Parks on Mosaic’s website here. It’s worth mentioning that there is also a political dimension to landscapes of rural England. Take for example the reporting and politicised nature of the foot-and-mouth outbreak or the trail of Mohammed Hamid, who was jailed in February 2008 for organising al-Qaida style training camps across Britain (read article in The Guardian here). In relation to ethnicity, this latter event is of interest. 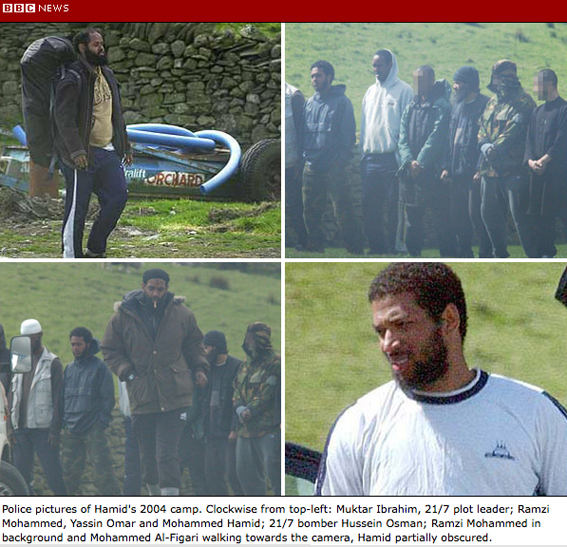 Photographs taken by two surveillance officers from Scotland Yard (above) showed Hamid, and several other Muslim men in a group of 23 others, on exercises at a farm in the Elterwater area of the Lake District. In the trial Hamid claimed these were bonding sessions to bring together Muslim men who felt vulnerable after 9/11. But police said he was trying to recruit and train young men for violent jihad. Hamid organised two more camps in the Lakes. The last on 17 August 2004 included 21/7 ringleader Muktar Ibrahim. MI5 officers covertly filmed this gathering. Hamid later organized excercises in secluded sites in the New Forest and paintballing centres in south-east England. This entry was posted on Friday, January 16th, 2009 at 9:35 am	and is filed under OTHER STUDIES, REPRESENTATION, RESEARCH. You can follow any responses to this entry through the RSS 2.0 feed. Both comments and pings are currently closed.